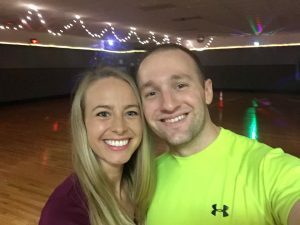 Ben Bechtel wrote a heartfelt post on Facebook recently about his experience watching his partner Lindsey struggle with Lyme disease. He talks about getting into the water with her, and helping her through the immense difficulties of life with Lyme disease. Thank you for giving us permission to share this, Ben. We hope it’ll show other partners and family members that they’re not alone! If you can imagine taking an olympic swimmer (your loved one), somebody full of drive and intelligence, somebody who’s worked their whole life for their big olympic race, and then tying a 50lb weight to their ankles just before the race, that will get you somewhat close to understanding. But then you have to imagine them still trying to swim (because that’s life), barely keeping their head above water, as their fellow athletes easily pass them to the finish line. Meanwhile, there are people in boats, screaming/offering advice to this swimmer with zero understanding of the heavy weight pulling them under. Sadly, the people in boats are often other loved ones or close friends that have to be told to row away due to their inability to help/ability to only further drown the swimmer. As a caregiver, I’m right next to the swimmer. In the water, but with no weight on my ankles. Desperately trying to help this person reach the finish line because I can’t bare to watch them drown. While slowly but surely everybody else rows away and the finish line is still so far in the distance. Sometimes you’re given a “tool” to help you stay afloat. Only to find out later that this tool only helped a little, didn’t help at all, or further contributed to your drowning. And truthfully, you often have to make these tools yourself, while drowning, because modern science is too far behind to help or even see the need. It’s heartbreaking yet unavoidable in the Lyme community. It’s nicer to stay in the boat. It’s dry, less tiring, and safe. But we owe it to ourselves and our fellow swimmers that are drowning to get in the water. It’s the only way the world will wake up and save the ones we love most. Lyme disease is a worldwide epidemic and if you don’t know somebody yet who has it, you soon will. The only way to stop the drowning is to start waking up, throwing your preconceived/judgemental attitudes out the door and getting in the water. If you’re still in the boat then you’re contributing to the drowning. Sorry, but you are. The swimmer has taught me a lot. They’ve showed me what it means to persevere and how strong the human will to survive really is. They’ve showed me what it means to truly fight for your life when everybody else is in boats and can’t see the weight. They’ve taught me how to cherish the “ok” days when you can’t swim towards the finish line, but at least you aren’t drowning, at least for a moment. Last night my beautiful girlfriend and I went rollerskating and were able to have fun/feel normal. At least for a second. Lindsey, I am so proud of you for your continuing fight. Words can’t describe how good it was to see you smile as big as you were last night. I love you and I will continue to help you reach that finish line. Thank you for allowing me to be in the water with you. Also, a special thank you to the rare few who are also in the water with us. Words can’t describe how much your understanding and encouragement means to us. If you have Lyme and are drowning, help is on the way. Together we will raise this awareness and put an end to this suffering. My heart goes out to you all.